Plants terrestrial, 10-25 cm. Rhizomes sympodial, proliferatively branching, units 2-30 cm × 1-1.5 mm, roots restricted to nodes. Stems erect, 1-1.8 dm × 1-2.5 mm. 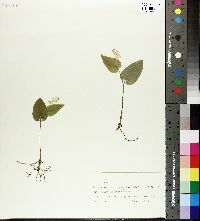 Leaves solitary on sterile shoots, 2-3 on fertile shoots; blade 4.5-7(-9) × 3-4.5(-5.5) cm, apex acute or short-caudate; proximal leaves sessile, blade ovate, base with narrow sinus; distal leaves petiolate, blade cordate, petiole 1-7 mm. Inflorescences racemose, complex, 12-25-flowered. Flowers (1-)2(-3) per node, 2-merous; tepals conspicuous, 1.5-2 × 0.8-1 mm; filaments 1-1.5 mm; anthers 0.2-0.4 mm; ovary globose, 0.8-1 mm wide; style 0.5-0.8 mm; stigma distinctly 2-lobed; pedicel 3-7 × 0.2-0.5 mm. Berries green mottled red when young, maturing to deep translucent red, globose, 4-6 mm diam. Seeds 1-2, globose, 3 mm. 2n = 36, 54, 72. Flowering early spring. Deciduous and coniferous forests, persisting in forest remnants and parks; 0--1800 m; St. Pierre and Miquelon; Alta., B.C., Man., N.B., Nfld. and Labr., N.W.T., N.S., Ont., P.E.I., Que., Sask., Yukon; Conn., Del., D.C., Ga., Ill., Ind., Iowa, Ky., Maine, Md., Mass., Mich., Minn., Mont., Nebr., N.H., N.J., N.Y., N.C., N.Dak., Ohio, Pa., R.I., S.C., S.Dak., Tenn., Vt., Va., W.Va., Wis., Wyo. Pubescent specimens of Maianthemum canadense in the western half of the range with consistently larger leaves have been treated as var. interius. Perennial herb with a slender rhizome flowering stem 5 - 25 cm tall Leaves: one to three, alternate, short-stalked to stalkless, 4 - 10 cm long, 3 - 5.5 cm wide, egg-shaped with a heart-shaped base. Inflorescence: an upright, 2 - 5 cm long, terminal cluster (raceme) of twelve to twenty-five flowers. Flowers: white, 4 - 6 mm wide, star-shaped, with four distinct, spreading tepals. Stamens four. Fruit: a one- to two-seeded spherical berry, from green to translucent red, 3 - 6 mm thick. Similar species: Plants in the genus Maianthemum (false Solomon's seal) are similar to those in the genus Polygonatum (true Solomon's seal) but differ in where the flowers grow. True Solomon's seal has flowers that grow and hang along the stem, while the flowers of false Solomon's seal grow in clusters at the end of the stem. Maianthemum canadense differs from other Chicago Region Maianthemum by having four tepals and four stamens, not six. Habitat and ecology: Locally frequent in rich woods. Notes: Spreads by rhizomes and may form colonies. Etymology: Maianthemum comes from the Greek words maios, meaning May, and anthemon, meaning blossom. Canadense refers to Canada, but is also used in reference to North America (a result of early French influence). Infrequent but usually common where found in low woods and in tamarack bogs throughout the northern part of the lake area. I found it in Jefferson County in a low, flat woods in soil of a pH value of 5.6 where it was associated with beech, sweet gum, and pin oak. Grimes reported it from Putnam County where it was associated with hemlock. Plants of this species with 3 leaves have been named Maianthemurn canadense f. trifolium (Farw.) Vict. (Contr. Lab. Bot. Univ. Montreal 14: 17. 1929). [Deam recognizes variety interius. Its lower leaf surface has pubescent veins and the leaf margins are ciliate.] The variety has about the same range as the species in the northern part of Indiana but it is not found in the southern part of the state. The species and its variety are of nearly equal abundance but one rarely finds the two in the same colony. The mass distribution of the variety is about the Great Lakes but it has outlying posts as far east as Massachusetts and ranges westward through central Ohio to central Iowa and northward. 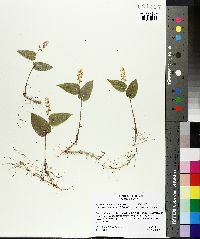 Stem 5-20 cm; lvs (1)2(3), short-petioled to sessile, 3-10 cm, ovate to ovate-oblong, usually cordate at base; raceme erect, 2-5 cm; fls 4-6 mm wide; fr pale red, 3-4 mm thick; 2n=36. Moist woods; Lab. and Nf. to Mack., s. to Md., S.D., and in the mts. to Ky. and N.C. May, June. The common form in most of our range, extending w. to Minn., has the lvs glabrous beneath, entire or very minutely crenulate, the transverse veins usually developed; this is var. canadense. The chiefly more w. var. interius Fernald, which occasionally extends e. to O., w. N.Y., and even Mass., has the lvs hairy beneath and distinctly ciliate, with the transverse veins more obscure.